The night before last, the humidity of the past week finally blew away. 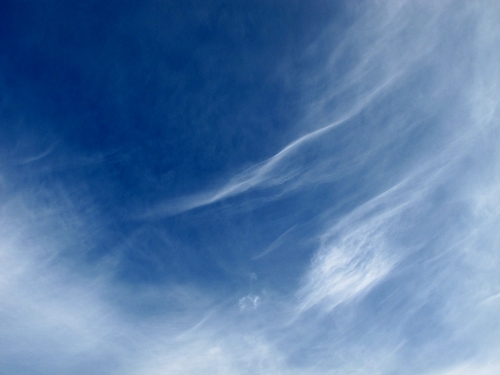 The air is clear and light again and, when the clouds part, we can see lovely, deep blue sky in place of a hazy mess. 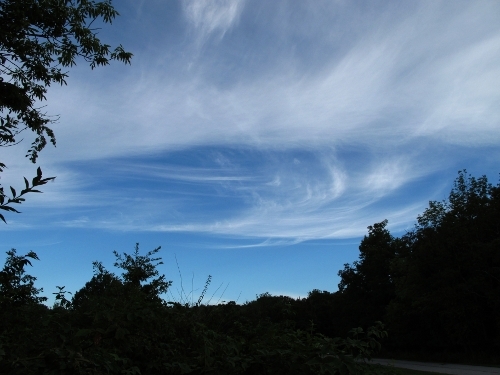 This morning that deep blue sky played host to a nice display of whispy cirrus clouds. Taking an opportunity to pull into a park on during my commute, I spent a few minutes enjoying and photographing the sky with cirrus for decoration. Great sky shots. The manservant, in his astro-dweeb guise, is observing in Chile tonight – he sent word that there is "spectacular seeing; but cloudy" – that sounds like an oxymoron. Lovely cloud pictures!! The color of the sky is beautiful too. He was observing on the Magellan telescope – luckily the clouds dispersed and the great seeing remained. They'd previously lost 2 nights because it was too windy to open. I hope that you do get to Keck, Magellan or even AAT (not always good seeing in Australia) some day – I'm sure that you would love it.